In a blatant plug for the Reagent Guide and the Reagents App for iPhone, each Friday I profile a different reagent that is commonly encountered in Org 1/ Org 2. If there’s one thing you learn how to do well in Org 1, it’s make alcohols. Let’s count the ways: hydroboration, acid-catalyzed hydration, oxymercuration for starters, and then substitution of alkyl halides with water or HO(–). If you want to extend it even further, there’s dihydroxylation (to make diols) using OsO4 or cold KMnO4, and even opening of epoxides under acidic or basic conditions to give alcohols. There’s just one issue here and it comes up once you try to use alcohols in synthesis. Let’s say you want to use that alcohol in a subsequent substitution step, getting rid of the HO(–) and replacing it with something else. See any problems with that? Remember that good leaving groups are weak bases – and the hydroxide ion, being a strong base, tends to be a pretty bad leaving group. What you want to do is convert the alcohol into a better leaving group. One way is to convert the alcohol into a sulfonate ester – we talked about that with TsCl and MsCl. Today I’m going to talk about a second approach: converting alcohols into alkyl chlorides with thionyl chloride (SOCl2). This is a useful reaction, because the resulting alkyl halides are versatile compounds that can be converted into many compounds that are not directly accessible from the alcohol itself. If you take an alcohol and add thionyl chloride, it will be converted into an alkyl chloride. The byproducts here are hydrochloric acid (HCl) and sulfur dioxide (SO2). There’s one important thing to note here: see the stereochemistry? It’s been inverted. *(white lie alert – see below) That’s an important difference between SOCl2 and TsCl, which leaves the stereochemistry alone. We’ll get to the root cause of that in a moment, but in the meantime, can you think of a mechanism which results in inversion of configuration at carbon? As an extra bonus, thionyl chloride will also convert carboxylic acids into acid chlorides (“acyl chlorides”). Like alcohols, carboxylic acids have their limitations as reactants: the hydroxyl group interferes with many of the reactions we learn for nucleophilic acyl substitution (among others). Conversion of the OH into Cl solves this problem. 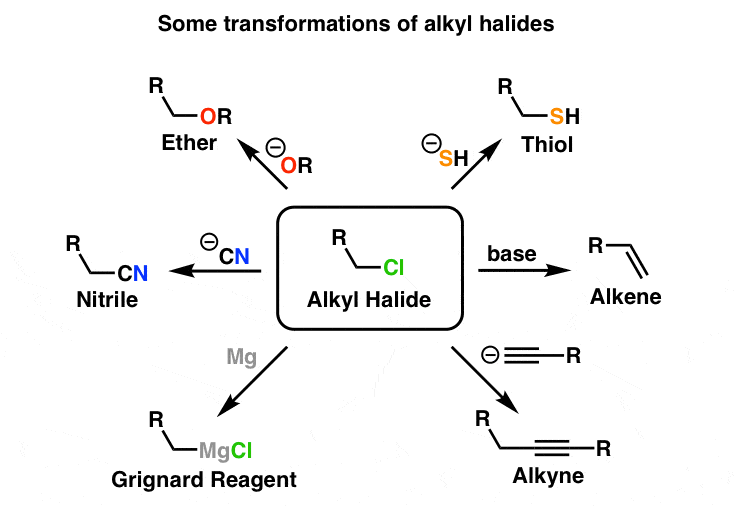 As you might have guessed, conversion of alcohols to alkyl halides proceeds through a substitution reaction – specifically, an SN2 mechanism. The first step is attack of the oxygen upon the sulfur of SOCl2, which results in displacement of chloride ion. 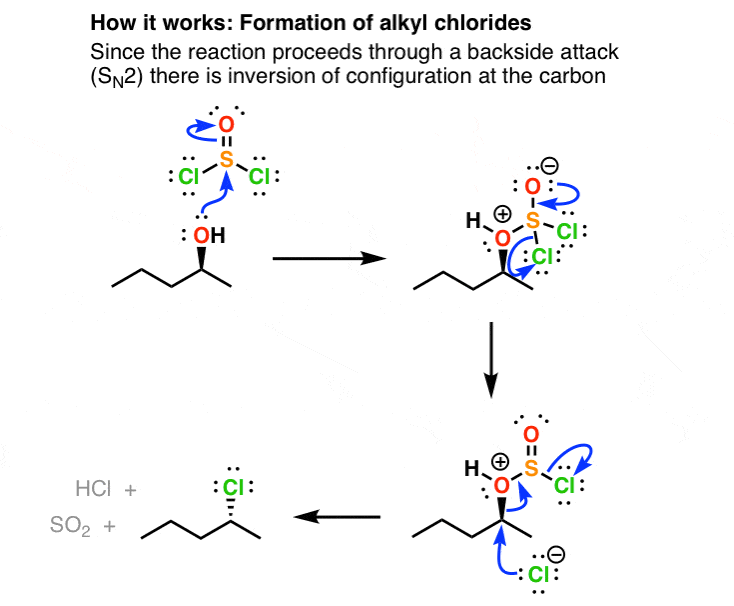 This has the side benefit of converting the alcohol into a good leaving group: in the next step, chloride ion attacks the carbon in SN2 fashion, resulting in cleavage of the C–O bond with inversion of configuration. The HOSCl breaks down into HCl and sulfur dioxide gas, which bubbles away. The mechanism for formation of acid chlorides from carboxylic acids is similar. Like many sulfur-containing compounds, thionyl chloride is noseworthy for its pungent smell. Thionyl chloride has a nauseating sickly-sweet odor to it that imprints itself forever upon your memory . One accident that occurred during my time as a TA involved a student dropping a flask with 5 mL of thionyl chloride into a rotovap bath outside the fume hood. The cloud of SO2 and HCl that formed cleared the teaching lab for half an hour, so you can imagine what thionyl chloride would do if exposed to the moisture in your lungs. Treat with caution, just as you would if you were working with phosgene. P.S. You can read about the chemistry of SOCl2 and more than 80 other reagents in undergraduate organic chemistry in the “Organic Chemistry Reagent Guide”, available here as a downloadable PDF. The Reagents App is also available for iPhone, click on the icon below! Make some extra space for the 3rd structure in the 4th reaction scheme (Formation of alkyl chlorides), so that the chlorine on the right is shown properly. But otherwise, great work, as usual. Maybe a few words about alternative reagents for this transformation would be useful, too. Thanks. I really appreciate your constructive suggestions. If you think thionyl chloride is bad, which it indeed is, you should also know it has an evil twin: Sulfuryl chloride (SO2Cl2). That is one unhappy liquid. I have thankfully avoided working with SO2Cl2, but that doesn’t mean I haven’t experienced it from fume hood neighbors. Nasty stuff! There are two mechanisms to this reaction. In general, treatment of a chiral secondary alcohol to thionyl chloride gives predominantly RETENTION of stereochemistry and NOT inversion….. True. That’s why I put the disclaimer at the bottom. I am going to do a acylation reaction of acid with thionyl chloride in persent of methylene chloride (solvent) and DMF(catalyst) at room temperature.i don’t have experience to this reaction. according to TLC method, Progress of the reaction is low. The raw material(acid) is a HCl salt in N atom. Your acid halide is probably hydrolyzing to the carboxylic acid on the TLC. I dont know. but the secont step is acylation of fridle-crafts and in this step i dont have produt. that is,probably i dont have acyl halide in the first step. Well, the coordination of oxygen to the sulfur makes the oxygen a good leaving group (much like a tosylate or mesylate); hence the chloride ion can then displace it in an SN2 reaction! I am sorry but who taught you that mechanism? 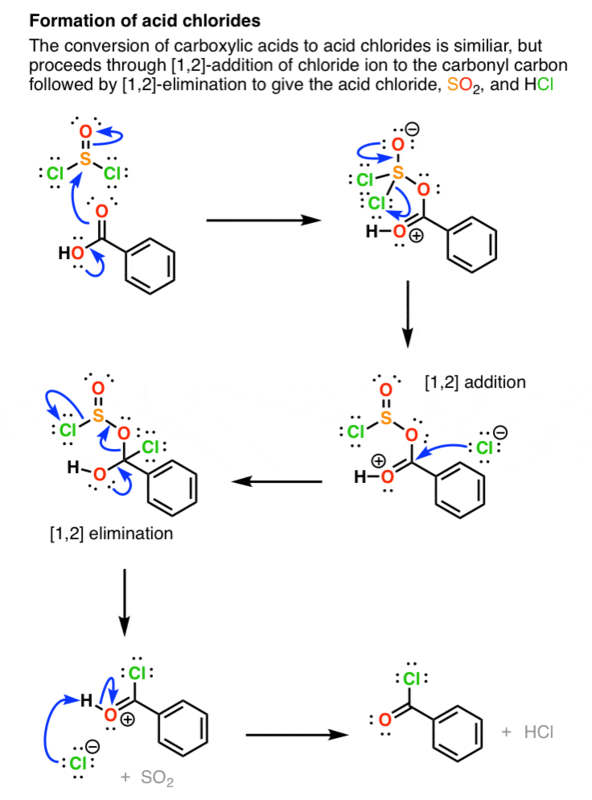 Alcohols and SOCl2 always react with retention and it’s an ipso-substitution, not SN2, there is no backside attack and no pentavalent transition-state. If you want an inversion, you need a catalytic nucleophile (e.g. lewis-base or heteroatom-solvent) which basically is cheating the mechanism because the nucleophile inverts the stereocenter, not the chloride, which itself inverts the new stereocenter. The mechanism as drawn above is wrong. It’s not a white lie, it’s just a wrong mechanism. SOCl2 is specifically used for retention! Oh sure, I’ll have your 2 metric tons of SOCl2 sent to Tehran by next Tuesday. You said that SOCl2 is sovent dependent. So please tell me What happens when SOCl2 reacts with (S)-2-butanol in presence of ether and also what happens when solvent is pyridine? The far I can guess that Both the solvents are polar aprotic and the reaction will go for Sn2 mechanism. So Tell me where will retention and where will inversion will occur. And also the products’ name from the reaction. i want to ask you sir .in mechanism of formation of chloroalkane with socl2 why sulphur is attracting electrons of oxygen yet oxygen is more electronegative? HI Dr. Nice to meet you. I am a PhD student from Malaysia. I have some problems regarding the reaction between carboxylic acid and thionyl chloride. I would like to react graphene oxide with thionyl chloride in order to change the COOH functional group on the surface of graphene oxide to COCl. May I know the what is the reaction conditions? How much temperature the reaction should be carry out and what is the amount ratio that thionyl chloride should be used? I really wonder if SOCl2 could produce a dense fumes or cloud of SO2 or HCl when spilled into water… I mean, you can recreate it once again. Although in my observation, it is possible only if amines (any amines or ammonia) content is present. Then the fumes (white cloudy) is hard to expel, because they settle down and exhausting them will be difficult. It most certainly does. Although you are correct that the react with amines or ammonia would be more rapid. I do have a question. How does the a reaction proceed when there is both an alcohol and an ester present? Esterification of Amino Acids in the presence of thionyl chloride and methanol for example. I assume it is a competing reaction, but the thing that confuses me is ester product is favored, while the alcohol seems to be more reactive. Any comments would be appreciated, Thanks. Dear Cody, your question is confusing. What exactly you want to ask. Does anyone have an experimental procedure for actually performing a chlorination of an alcohol with inversion of configuration? I’ve found lots of slides and lectures notes on the theory behind the mechanism, but nothing stepwise showing how it was really performed in a lab and what yields were achieved in the product. I recently tried this experiment with a trans-4-t-butylcyclohexanol/pyridine and SOCl2 and seemed to fail quite miserably. is it possible to convert ketone(C=O) into chloride(C-Cl) by by thionyl chloride and DMF? No, it isn’t. By itself, the process you describe is a reduction. Thanks for suggestions about reaction with socl2. congratulations for the blog it’s very well wrote and good. I have a question, if a molecule have an ester and a carboxylic acid on it’s structure, what do you thing the thionyl chloride will prefer to attack or will attack both? Instead, the thionyl chloride should convert the carboxylic acid to an acid chloride. Esters will not react with thionyl chloride. That s a really wonderful website! Makes thing much much clearer than with my quite obscure class…. Thank you YH. Glad it’s helpful. Actually this blog is really helpful. But I still confuse about how to control the reaction if there are several functional groups are present in the molecule such as alcohol and carboxcylic acid, and I wanna produce an amide product ? How to avoid thyonil chloride attacks the alcohol ? So it prefer to the carbocylic acid ? I’m still doing my thesis. Use protecting groups, for Pete’s sake. Don’t try to screw around with multiple unprotected functional groups. It’s too hard. I have a question can we prepare amide from amino acid and an amine by thionyl chloride without any protection of amine group of aminoacid? In your “formation of acid chlorides” mechanism, I noticed that in the principal step with the concerted elimination you showed the chloride departing from the sulfoxide directly, rather than via a tetrahedral intermediate in addition-elimination style. My understanding is that when the carbon variety of acyl halide undergoes nucleophilic addition, the pi bond first breaks and localizes to the oxygen before a lone pair there reforms the carbonyl and kicks out the halide in a beta-elimination via lone pair mechanistic step. I understand this happens rather than the halide departing in a concerted fashion when the carbonyl is attacked (i.e., an “SN2”-style mechanism), because the carbonyl pi-bond is weaker than the C-X sigma bond. So, my question is: is your depiction of an “SN2-style” attack on the sulfur accurate or just for convenience? I believe sulfur can undergo SN2-like substitutions via a pentavalent intermediate (as opposed to transition state), but I’m not sure if that would really apply here. Which bond breaks first in reaction of an isolated chlorosulphite with 1-phenylmethanol?which(C-O or S-Cl) bond break first in mechanism,because both bond break simultaneously,and it is still not certain is written in book. It is unclear from your question exactly what reaction you are referring to. It’s possible that the S-Cl bond breaks first, giving an ion pair, and then Cl- attacks carbon. That would be my guess. The oxidation state on sulfur is wrong. You’d get dimethylsulfite. I think you would get a mess, to be honest. SOCl2 to benzyl alcohol would conceivably get you benzyl chloride, but once you add AlCl3, it’s going to be a messy polymerization. Is it possible to have a selective chlorination with SO2Cl when in the molecule there are both carboxylic acid and alcool? The reaction of methanol with thionyl chloride and tetrahydrofuran results in the opening of opening of the furan ring. Read the useful obeservations and comments. Um, that’s because the reaction with SOCl2 and methanol makes anhydrous HCl, which has been known to cleave ethers. Could you please comment on the possible reaction of phenols and SOCL2 ? Is there any chance that they undergo similar transformations like alcohols? Absolutely not, substitution reactions (SN2) do not work on aromatic systems as backside attack would have to occur from within the ring.